The most important element of a baseball swing happens in the lower half of the body. The hips are the primary element of drive and power behind the ball, and explosive action in the hips will begin in the legs. The force of the connection between the bat and the ball will depend on a baseball player’s contact with the ground, delivery of power up through the legs, and diffusion of that power through the hips and upper body. The high knee baseball hitting drills demonstrated in the video below are designed to build explosive power in the legs and lower body. These hitting drills can help a player establish a strong, centered stance, and use that stance to put all the power of the lower body directly into the swing. This hitting drill will depend on the strength building impact of the Kbands resistance bands, so before putting the exercise into action, players will need to attach the bands to the upper legs using a level of tension that matches each player’s current level of strength and lower body control. By placing targeted tension on the adductor and abductor muscles of the upper legs, the Kbands help build balance and coordination at a far faster rate than ordinary tension can provide. Once the Kbands have helped players build power in these muscle groups, players will be able to generate greater lower body force and hit the ball farther and faster after the bands are removed. To begin this set of baseball hitting drills, players will need to attach the bands, establish a stance that makes them comfortable, and set the ball on the practice tee (or have a partner toss the ball across the swing area). Each player’s stance will vary slightly depending on his or her preferences, but in all cases, the feet should be widely spaced and the weight should be placed inside the toes and inside the knees. Then the player will raise the knee into a leg kick that’s slightly higher than normal. As the knee rises up and pulls the adductor and abductor muscles against the tension of the bands, the weight of the body will stay inside the back knee and inside the back foot. 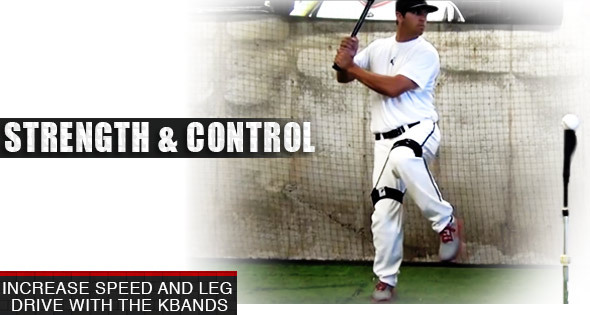 Baseball players should attach the Kbands and complete the entire process from stance, to knee lift, to full swing, ten times without a significant pause between each swing. They should cycle through these ten reps three times. Then they should unclip the bands from the Kband straps and complete three additional sets of five swings each. During both the resisted and un-resisted sets, the body position and stance should be normal and the range of motion should be complete. At each swing, the baseball player should be encouraged to feel the transition of explosive power as it moves from the ground, up through the legs, into the hips and through the arms to the ball. As players concentrate on the development of this explosive force, they build muscle memory with each swing. Eventually the generation and distribution of force will become automatic. When this happens, the body will accurately concentrate that force behind the ball, and the legs will have developed enough strength to increase both the speed of the ball and the distance it will travel. As a follow up to the high knee drill offered in this video, baseball players and coaches can also try the “rhythm of three” drill found in the baseball section under the training tab. These drills build on each other and can both become valuable components of a complete baseball training program. Add them to the others on the site for strategic approach to your season. For more information on baseball body mechanics, building force and accuracy into the baseball swing, and increasing the explosive strength generated by hip flexors, upper legs, lower legs, and core, visit the training tabe above and explore the baseball related videos and articles on the site.